Originally, our Alaska Airlines flight from Seattle to Hawaii was to have departed Seattle at 4:45pm, which would have had us into Honolulu by 7:45pm. Unfortunately, Alaska moved the flight back to 7:30pm, almost 3 hours later. While this did give us more time with our Seattle relatives, which was nice, it meant a long, exhausting travel day for both of us. I eventually woke up the drowsy munchkin, who had fallen asleep on a makeshift bed in the Alaska Airlines Board Room, and we made our way to the gate. We were again in 2D and 2F, and we even recognized a British passenger in 1F who had been on our original flight from NYC to Seattle, so we greeted each other. I don't think he was visiting anyone in Seattle, so hope he at least got to see the city or something besides the Alaska Airlines lounge, since that was a very long layover. Again we were on a 737-800, and the cabin, as you'd expect on most Hawaii domestic first class flights, was completely full. 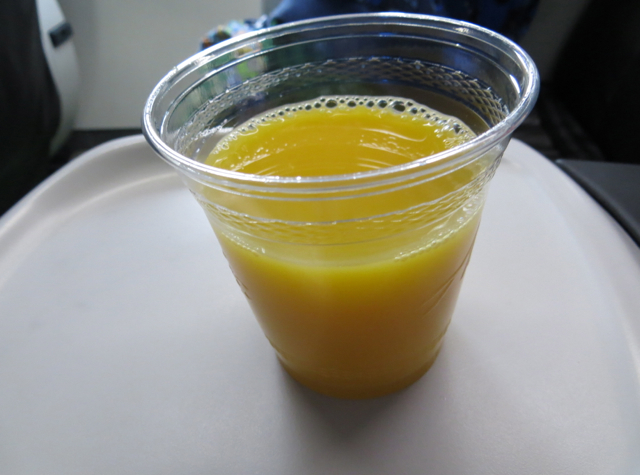 We were offered pre-flight drinks, and had some orange juice. First priority, however, after we took off and were at cruising altitude, was getting the munchkin settled as comfortably as possible given the uncomfortable seats. There was no chance he was going to be able to sleep sitting up in seats with such limited recline, so instead I padded the armest with a fleece so he could somewhat lie down. 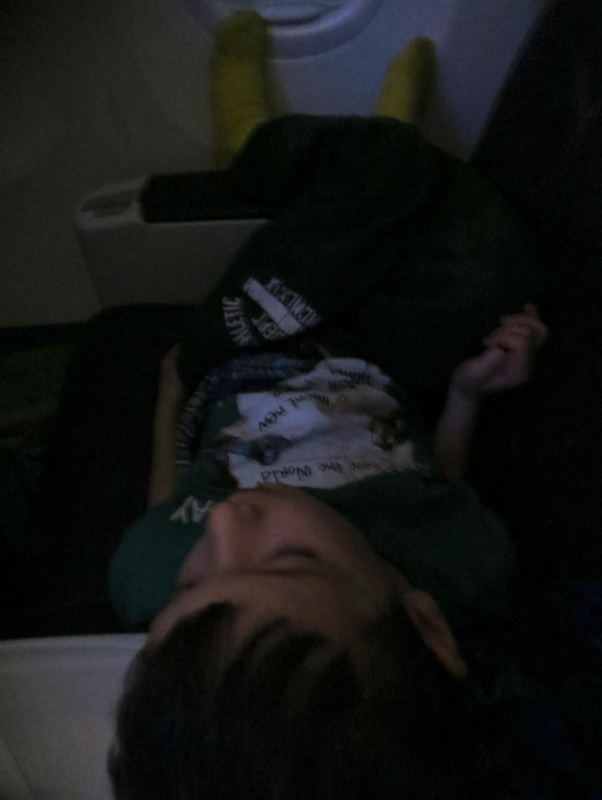 It was a pretty contorted position, but he somehow managed to get some rest for the first part of the flight. Meanwhile, I opted to have dinner, and asked one of the attendants working the first class cabin to save the munchkin's meal for later, when he woke up, which she agreed to do. There were some bagged nuts of some kind as a pre-dinner snack, but I passed on those. 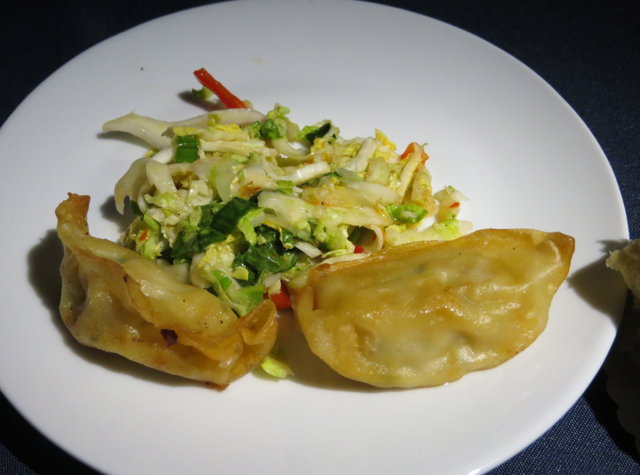 The appetizer, of two potstickers served with Thai chili slaw, was actually quite good. 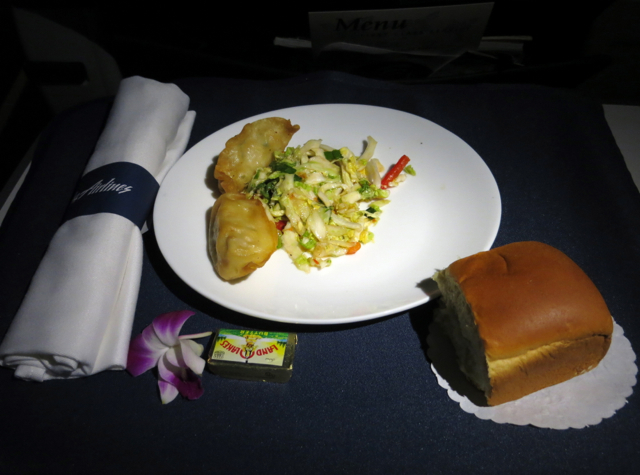 Sure, we get better potstickers at a number of places in NYC, such as Wa Jeal, but for airplane food, it was very decent, and I was surprised by the nice chili flavor of the slaw. Usually, unless it's Singapore Airlines Book the Cook, airlines seem to shy away from anything spicy, especially when no other menu option is given. Understandable, since not everyone can tolerate spicy food, so I found it interesting that the slaw was as spicy as it was. There was also a limp orchid on the plate (A for effort, B for execution) and a warm Portuguese sweet bread roll that was a nice touch. The “Chicken Mango Stew” sounded spectacularly unappetizing, so I chose the Wild Alaskan Teriyaki Glazed Salmon, even though I normally avoid fish entrees because they almost invariably are overcooked in the course of reheating them. It was the same here–and this was obviously for cost reasons not Alaskan King Salmon, which is rich enough that it might have survived overcooking a bit better–it tasted like Sockeye Salmon, which I've never cared for, but at least wild salmon is good for you, and the teriyaki glaze helped with an otherwise miss of a dish. 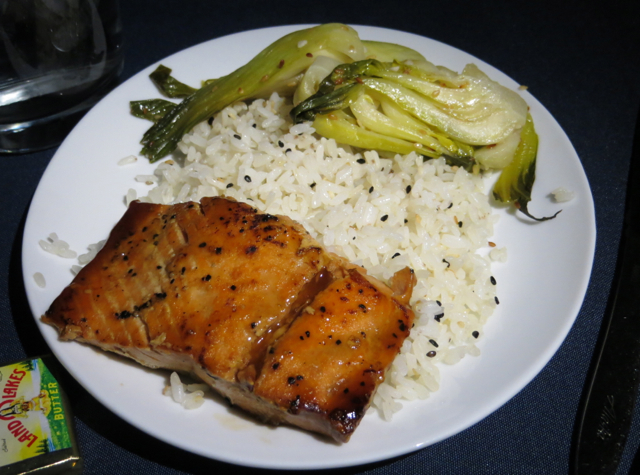 The “sticky rice” didn't seem sticky in the least, and the stir fried bok choy were, similar to the salmon, way overcooked. 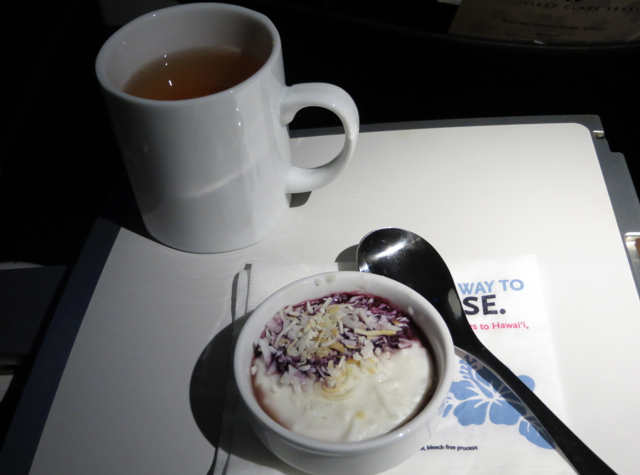 After the dinner dishes were cleared, cabin lights were dimmed and I wondered if the Haupia Pudding dessert hadn't been catered or if the flight attendants had simply forgotten about them. I did some work for about an hour, but knew I wouldn't be able to nap given how uncomfortable the seats were, so eventually I asked one of the flight attendants for some tea and if there was any dessert. She replied that they usually served dessert later on in the flight, but that she could bring me my dessert with my tea. Normally I can take or leave haupia, but this was a creamier, less gelatinous version than is usual, and also came with an interesting berry sauce of some kind, garnished with toasted coconut. It was rich and delicious–much better than the overcooked main course, and also better than the appetizer. If only the rest of the meal could have been of the same quality. That said, you do of course have to like coconut to like this dessert. The munchkin didn't care for his, when he eventually woke up and had his dinner. No surprise, but my assessment of Alaska Airlines first class seats was only confirmed with this flight: I never plan to fly Alaska Airlines again, given the very limited recline and how uncomfortable they were, even though I will happily use Alaska Airlines Mileage Plan miles to book their partners, such as Cathay Pacific and Emirates. 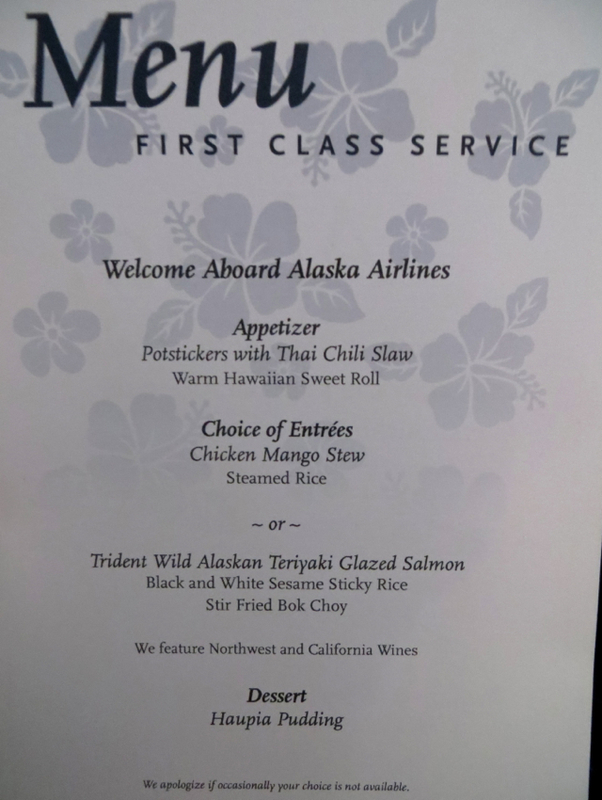 Food was decent, and probably better than on some other domestic carriers' business and first class flights to Hawaii. Service on this flight was fine, but not as good as on our first flight and not overly friendly. But what I care most about on any long flight, Hawaii included, is seat comfort, and as I noted to a commenter on my prior post, I'd take a flat bed United BusinessFirst seat and non-existent service any day over these Alaska Airlines First Class seats and stellar food and service. 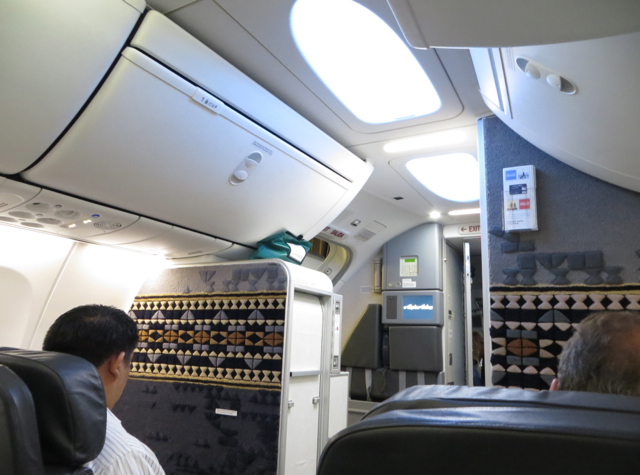 If you've flown Alaska Airlines first class to or from Hawaii, what was your experience?